It may be the hardest decision in your life or one which you consciously choose to help you save money; eating on a budget of $20 or less. 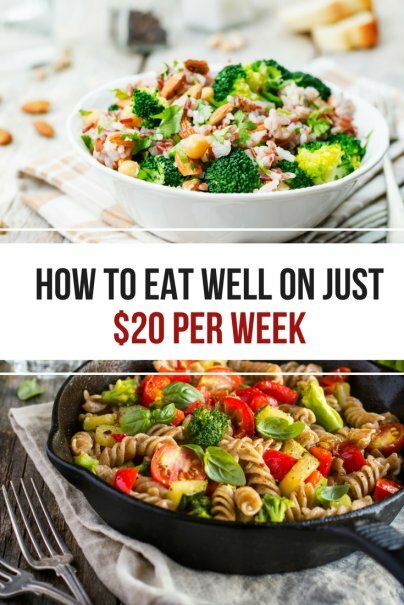 Is it really possible to eat healthy on just a single $20 note? The better question is whether it’s possible to find food locally which can keep costs down enough that you achieve your goal. Whichever your reason for eating on a budget the following tips will help you keep your costs low and your stomach full. The fastest route to eating on $20 a week is to seek out local farmers markets which offer food from local farmers at a highly discounted price. At these farmers markets, you’ll be able to find a wide range of vegetables, fruits and homemade goods for just a few dollars. Pick up whatever essentials you can find here that will keep your costs within your $20 budget; remember to pick items which will keep you healthy and energized as well. The big box companies only difference in quality between off-branded food products is the marketing campaigns. Large companies will spend millions on marketing their food which in turn raises the price of each individual item. Because off-brand food doesn’t go after a wide market, you’ll be able to find the same quality food at nearly half the cost. Many food chains have begun opening more shelf space for off-brand food products but you may still need to seek out places such as dollar stores to find the largest variety. Food that has its packaging damage doesn’t mean it’s gone bad; it’s just lost its visual appeal. Large food chains do not want to sell items which have ripped packages, dented cans or have become maimed during the shipping process; however, this is your opportunity to find many great food products for very cheap costs. Scratch and dent stores are all around the country usually located in smaller shopping centers. With just $20 you can walk away with grocery bags full of food that will hold you over the entire week. Many families throw out whatever left over after their meal; this food isn’t bad but the attractiveness is enough to essentially throw away money. To stick to a budget of $20 a week for your food, be conscious of what you throw out and always save leftovers. Most people have the misconception that eating out is very expensive but that’s because they often visit large restaurant chains that will make up for their marketing and employees by increasing the food price. Instead of going out to a restaurant, consider swinging by a local street vendor that’s selling food. It may seem dangerous at first but these food vendors fall under the same stipulations that restaurants have in terms of quality and safety of food. Local food vendors will offer a wide range of ethnic foods that will not only open your food horizon but allow you to eat on a budget of $20 a week.